You can easily output a list or grid of downloadable products using the [downloads] short code. This short code accepts a variety of parameters that allow you to specify what downloads are displayed, and how they are displayed. This will output the downloads in a three column grid with thumbnails (if present), a 30 word excerpt, and a purchase button that says "Add to Cart". You can find a category's ID by going to Dashboard → Downloads → Categories, then click "edit" below the category in question. On the page that loads, look at the URL in the address bar and find "tag_ID=". The number after it is the category ID. Use the same process to find a tag ID by going to Dashboard → Downloads → Tags. The exclude_category and exclude_tags parameters are used to prevent downloads with specific categories or tags from being displayed. Use a comma separated list of IDs for each. The order parameter accepts either "DESC" or "ASC". If orderby is set to random, pagination will be disabled to prevent subsequent pages from showing already-displayed products. The relation option is for specifying whether the downloads displayed have to be in ALL the categories/tags provided, or just in at least one. Use "AND" for showing downloads that are filed in every category/tag (very specific), and use "OR" for showing downloads filed in any of the given categories / tags. Leave both of these blank to show all downloads. Price, excerpt, full_content and buy_button accept "yes" or "no". The thumbnails parameter requires "true" or "false". 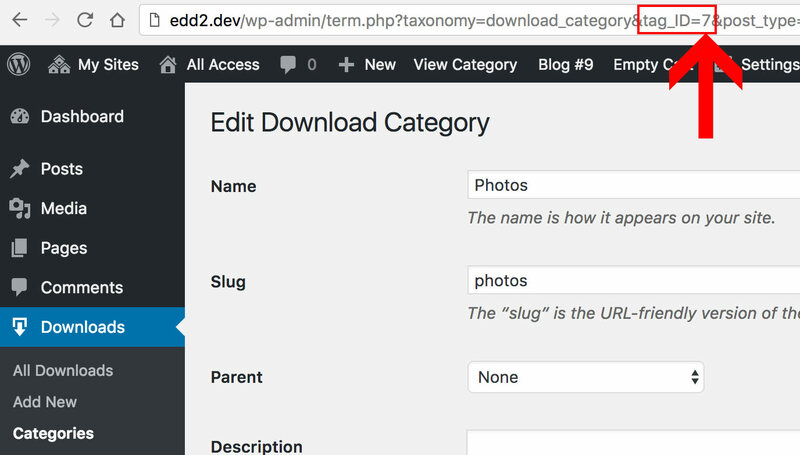 It is possible to customize the content that is output by the [downloads] shortcode by moving templates files into your child theme's folder. Specifically, you'll likely want to move the template file called "shortcode-download.php", or one of its child files into your child theme's folder. To do this, follow the guide in this doc. Note that doing this requires advanced WordPress theme coding knowledge. If you require assistance with this, we have a consultants page with professionals available for hire for custom code-related jobs like this.